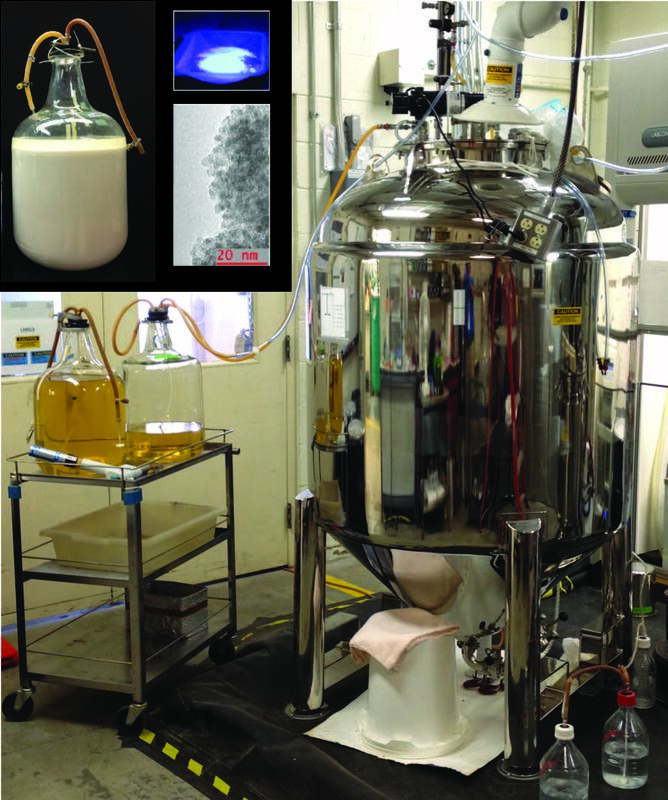 Using this 250-gallon reactor, ORNL researchers produced three-fourths of a pound of zinc sulfide quantum dots, shown in the inset. A method to produce significant amounts of semiconducting nanoparticles for light-emitting displays, sensors, solar panels and biomedical applications has gained momentum with a demonstration by researchers at the Department of Energy’s Oak Ridge National Laboratory. While zinc sulfide nanoparticles – a type of quantum dot that is a semiconductor – have many potential applications, high cost and limited availability have been obstacles to their widespread use. That could change, however, because of a scalable ORNL technique outlined in a paper published in Applied Microbiology and Biotechnology. Unlike conventional inorganic approaches that use expensive precursors, toxic chemicals, high temperatures and high pressures, a team led by ORNL’s Ji-Won Moon used bacteria fed by inexpensive sugar at a temperature of 150 degrees Fahrenheit in 25- and 250-gallon reactors. Ultimately, the team produced about three-fourths of a pound of zinc sulfide nanoparticles – without process optimization, leaving room for even higher yields. The ORNL biomanufacturing technique is based on a platform technology that can also produce nanometer-size semiconducting materials as well as magnetic, photovoltaic, catalytic and phosphor materials. Unlike most biological synthesis technologies that occur inside the cell, ORNL’s biomanufactured quantum dot synthesis occurs outside of the cells. As a result, the nanomaterials are produced as loose particles that are easy to separate through simple washing and centrifuging. The results are encouraging, according to Moon, who also noted that the ORNL approach reduces production costs by approximately 90 percent compared to other methods. “Since biomanufacturing can control the quantum dot diameter, it is possible to produce a wide range of specifically tuned semiconducting nanomaterials, making them attractive for a variety of applications that include electronics, displays, solar cells, computer memory, energy storage, printed electronics and bio-imaging,” Moon said. Successful biomanufacturing of light-emitting or semiconducting nanoparticles requires the ability to control material synthesis at the nanometer scale with sufficiently high reliability, reproducibility and yield to be cost effective. With the ORNL approach, Moon said that goal has been achieved. Researchers envision their quantum dots being used initially in buffer layers of photovoltaic cells and other thin film-based devices that can benefit from their electro-optical properties as light-emitting materials.